Samsung NX3000 and Sony A5000 are both budget entry-level mirrorless digital camera models that are heavily popular on the market. Samsung NX3000 comes from the Samsung’s NX series, which boasts a comprehensive list of smart features that simply widens the camera functionality. Meanwhile, Samsung A5000 somehow reminds people of the more expensive yet also hugely favored Samsung A6000. If you are seeking for a camera under five hundred dollars, then these products certainly stand on your top priority list. Then, which one should you choose? – The prices. Not exactly identical, maybe the prices differ a couple of bucks from each other, but they are roughly the same. – The strength of the image sensors and the maximum image resolution. Both Samsung NX3000 and Sony A5000 use 20 MP CMOS sensors. Thus, they can capture images in similar details and sharpness and sizes. – The display screens. Each of the models has an articulating screen with 461k dots resolution. This is a very handy feature that will tremendously help you in taking pics from difficult and tight angles. – Both models do have the AE bracketing feature, which is useful to adjust the camera focus to a certain distance. Excellent for tough lighting conditions and HDR photography. – Samsung NX3000 and Sony a5000 have built-in Wi-Fi for easy file sharing to other devices. – Neither comes with built-in image stabilization and viewfinder. – It comes with built-in flash. Flash is often considered a must for many cameras to improve brightness and illumination of the picture objects. If you don’t want to spend extra cash to get a separate flash accessory, then Sony A5000 is a huge value for you. -It supports time-lapse shooting and recording. A nice addition to creative works. – It has a bigger RAW buffer than Samsung NX3000 (9 vs. 4), which means that it can capture more frames before needing to take a break. Thus, it can have a better performance than Samsung NX3000. – Though it doesn’t have built-in flash, it has an external flash shoe. So, once you equip it with a flash, it can give you an even better brightness and illumination. – It has a slightly higher continuous shooting speed (5 fps vs. 4 fps). Not exactly a very good choice for fast-paced objects, but its edge is a little bit better here. – It has slightly more focus points, allowing you to pronounce more things in your pictures. – It has a higher ISO range, up to 25600 (Sony A5000’s is 16000). All in all, each model indeed has each own advantages. 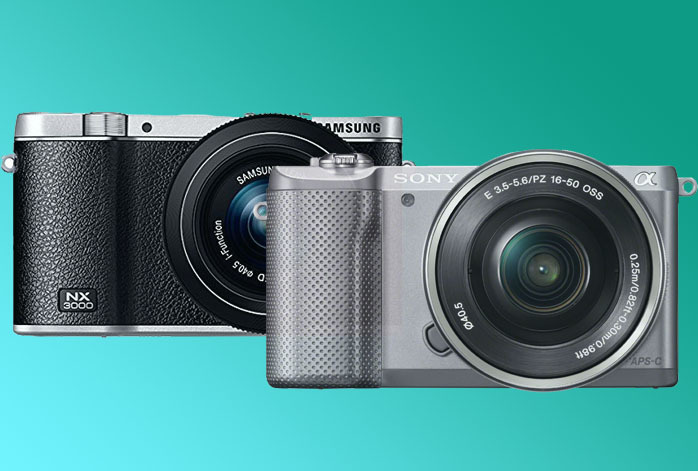 However, we recommend you to choose Sony A5000 over Samsung NX3000 because it can give you a more convenient usage. The bigger buffer capacity is especially beneficial, allowing you to stay ready for the next few moments.